One of the greatest of all filmmakers, Satyajit Ray, debuted with a first feature, Pather Panchali (1955), that was so good it ranks as one of the finest films ever made. It is interesting that a number of outstanding filmmakers, including Jean Vigo, Orson Welles, Jean-Luc Godard, Francois Truffaut, and Terrence Malick, hit their highest levels with their first film outings. In all cases, though, these first-time directors were originally avid and thoughtful students of film, and they were very well cultured in cinema technique before they shot their first scenes. In Ray’s case he had been thinking about and planning how he would make that first film for many years before he started it. He came from a cultured Bengali family, and Ray early on showed talents in graphic design, calligraphy, musical composition, and writing. In his twenties (during the 1940s), Ray worked professionally as a graphic designer, but he developed a passion for films and set his sights on eventually becoming a filmmaker. For a number of years during this period, he thought about making a film based on Bibhutibhushan Bandopadhya’s famous semi-autobiographical Bengali novel, Pather Panchali (“The Song of the Little Road”, 1929). Ray’s first feature covers the first part of that novel, and two of his subsequent films, Aparajito (1956) and Apur Sansar (The World of Apu, 1959) completed the account. 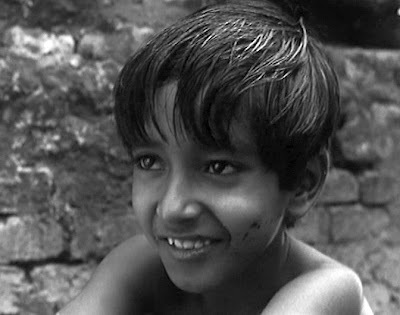 Together the three films on this subject are known as the Apu Trilogy. I mention all this planning, because when Pather Panchali appeared to Western audiences, it was initially compared to Italian Neorealism films, a documentary-style film genre that was thought to be captured-life in the raw. 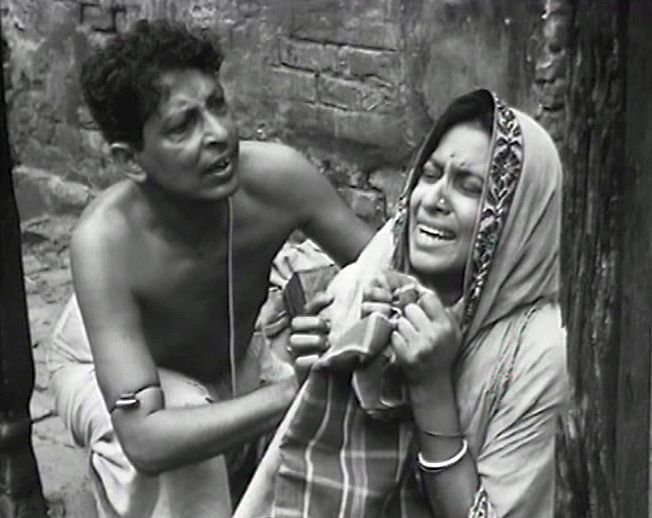 But although Ray engaged in experimentation during the filming of Pather Panchali, the film was carefully planned and staged in order to achieve its extraordinarily effective visual and emotional effects. The story covers the experiences of a an impoverished family of four living in a small Indian town. The father, Harihar (aka “Hori”) Roy (Kanu Banerjee), is a Brahman who makes his living by conducting religious rituals. But he has dreams of someday becoming a famous writer. His wife, Sarbajaya (Karuna Banerjee), struggles to make ends meet with the meager income obtained by the not-very-practical Hori. They have a daughter, Durga, and a son, Apurba (“Apu”). They also have a very elderly female relative, Indir, who the children refer to as “Auntie”, but given the complicated structures of Indian extended families, her precise relationship to the others is not clear. What goes on in the film is primarily seen from the multiple focalizations of Sarbajaya, Indir, Durga, and Apu. In the opening sequence of about twenty minutes, we are introduced to the Roy family just prior to the birth of Apu. Hori talks about his plans to become a great writer, while Sarbajaya complains to Hori that he doesn’t attend to making an income to provide them with enough food and comfort. Durga, who is about seven or eight years of age, likes to steal fruit from the nearby orchard belonging to the neighboring Mukherjee family, whose matron complains bitterly to Sarbajaya that Durga thus has a poor upbringing. Undaunted by such accusations, Durga always passes some of the purloined goods to her beloved “Aunt” Indir, who is hunchbacked and emaciated. In fact throughout the film we see an affinity between the child Durga and the ancient Indir. Both of them are petty liars and thieves, stealing little scraps of food whenever the opportunity presents itself. But both of them share a joie de vivre – a readiness to be delighted by any new curiosity that comes their way. This is always an endearing trait of the very young and the very old. And both of them pass away during the course of the story. It’s worth commenting here that the performance of Chunibala Devi as Indir is extraordinary and one of the most memorable aspects of the film. She was over eighty years old during the production and died shortly after the film was released, but her wizened visage always lights up the screen with vitality and anticipation throughout the story. After Apu is born, the story shifts forward in time about six years later, and his life as a small schoolboy is covered. Durga is still a fruit thief and dispensing the spoils to Indir, but now she is accused of a more serious crime: stealing jewelry from one of the neighbor Mukherjee daughters. Although Durga swears that she is innocent of this particular crime, the accusations again cause Sarbajaya to suffer. Losing face in a small village, which constitutes your entire world of relations and from which there is no escape, is torture for the mother who has no other means of support. Dignity is one of the major concerns for the elders in this story. In terms of material possessions, these people have almost nothing. But Hori dreams of being a respected writer, and Sarbajaya wants to be free from the scornful wrath of the neighboring Mukherjee housewife. In fact she is so troubled by the Mukherjee accusations against Durga that she drags the poor girl by her long hair and temporarily casts her out of the door of their household. And Indir, who is essentially a freeloader on the Roy family, also suffers from the dismissive treatment she receives at the hand of Sarbarjaya. The kids, Durga and Apu, on the other hand, just want to have fun. They long for a few treats from the local sweet-seller, and they are excited by occasional festivals or Jatra performances, which are theatrical shows put on by itinerant performing troupes. But then the second half of the film features two key narrative sequences that move the story forward – the excursion to the train sighting and the death of Durga. Both of them are expertly realized by Ray and constitute the dramatic high points of the film. 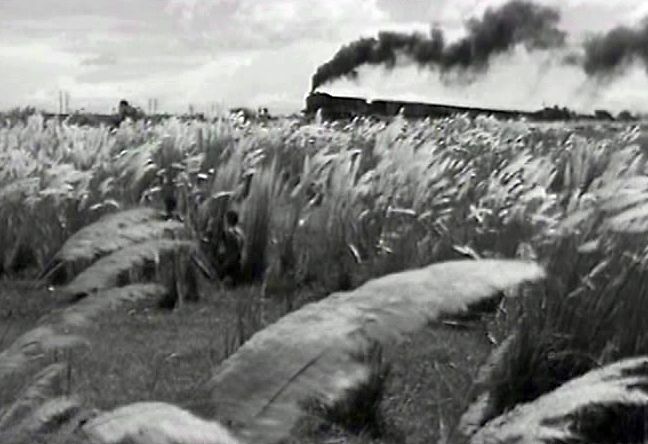 The first such narrative element is a parallel-action sequence featuring Durga and Apu along one track and Indir along another. After watching the Jatra performance, Apu takes some ornaments from Durga’s toy box and dresses up like one of the performers. Durga is annoyed by Apu’s cheeky messing around with her few belongings, and they have a spat. The young Apu, who idolizes his big sister, is terribly disturbed by Durga’s scoldings and doesn’t know what to do. In a memorable sequence, Durga runs out into the fields, knowing that the worshipful Apu will follow her. She leads him a long way to where the railroad tracks are, and then she waits. In due time a railroad train (which Apu had never seen) comes hurtling down the tracks – a wonderfully thrilling and almost magical phenomenon for the astonished children. When you see this sequence, you get the feeling of the rapture that these children must have felt at the sight of the train. In parallel with this action concerning Durga and Apu seeing the train, are shots of Sarbajaya, testily casting Indir out of their household because Indir had caused Sarbajaya to lose more face by accepting a gift from another neighbor. Indir goes out into a wooded area, sits down, and dies. As Durga and Apu happily return from their excursion to see the train, they come upon Indir’s dead body. The second key narrative element comes after Hori departs on a trip to a rich landlord’s estate with the intention of getting paid for some requested religious rituals. This expected job turns out to fall through, and Hori goes further away looking for work and not communicating with his wife for months. 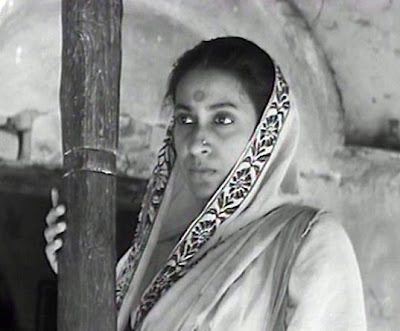 In his absence, Sarbajaya’s family sinks into desperate circumstances, and she has to hock her dowery cutlery. But after five months, she finally gets a letter from Hori announcing that he has made some good money and will soon be returning. Things are looking up. But the monsoon rains are about to come. In India the coming monsoons represent change and anticipation. They will bring a welcome break from the intense summer heat and needed rains for farming. But the rainstorms can wreak havoc and be destructive, too, so the monsoons combine a promise with a threat. Ray builds this mood up brilliantly with a lyrical sequence of images and sounds (both diegetic and musical) connoting the season of change and the gathering storm clouds. There is a little scene showing Durga performing the Punyipukur brata, which is a Bengali Hindu ritual puja for young girls that prays for fertilizing rain and the fortitude to endure whatever comes. Then she runs out and meets Apu in the mango orchard by the pond for some fun. A thunderstorm suddenly comes on, but Durga joyfully wades into the pond and dances in the midst of the downpour. However, the drenching gives Durga a chill, and she becomes ill. She is put to bed and attended to by the local doctor, but her illness worsens. As the monsoon winds and rains intensify, battering their little cottage, Sarbajaya sits at Durga’s bedside with a feeling of terror and powerlessness. Before the rains retire, their cottage is destroyed and Durga dies from her fever. The next day, after being away for many months, Hori returns with money and presents for his family. Sarbajaya greets him silently but then faintingly cries out over their misfortune, her agony memorably intensified from the soundtrack by the high-pitched sound of the sarange stringed instrument. Shortly thereafter Hori decides to leave his ruined home and take his family to Benares (now called Varanasi). Just before their departure, though, Apu discovers to his shock the jewelry beads that Durga had evidently really stolen from the neighbors. He takes them over to the pond and throws them in the water so that noone will ever know that Durga did steal them. The final shots show the family sadly departing their village on an oxcart and headed off further on the little road of life. 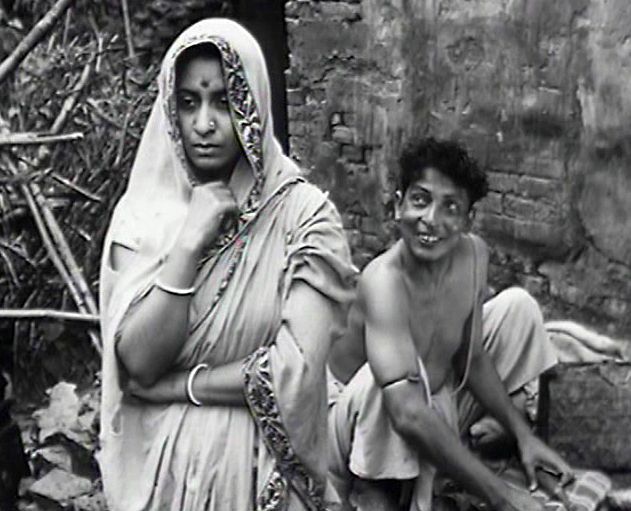 The sometimes rambling nature of Pather Panchali and its apparently literal and artless expression (many of the actors were nonprofessionals) have led some critics to suppose that the film is an innocent outing of a novice director recording the local color of an Indian village. But this outstanding film is anything but artless, and a study of the cinematography, editing, and overall composition is well worth the effort. Ray began filming Pather Panchali in 1952, but his shoestring budget forced a number of delays while he sought additional funds; and the production was only completed three years later. 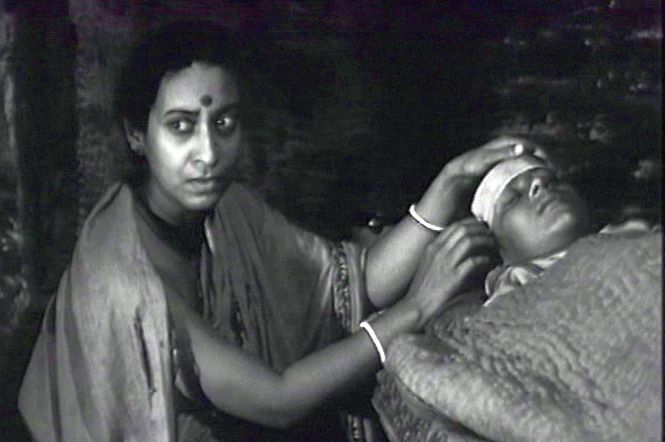 Although the film was shot mostly in sequence, these delays must have presented concerns, given that two of the key performers were growing children and Chunibala Devi was of frail health. On top of that, Ray’s cinematographer, Subrata Mitra, was completely inexperienced – at the beginning of the production he was only 21 and had never held a movie camera in his hands before. Nevertheless, the cinematic expression in the film (both the cinematography and the editing) is extremely good and an important component to the film’s success. There are constant short tracking and panning shots that maintain the pace of the film. Numerous closeups are interspersed effectively with the medium shots to maintain a visual dynamism throughout. The film gives the appearance that it was shot entirely on location, but in fact there were some studio scenes that are seamlessly woven into the presentation. In addition the soundtrack, which includes both the contextual sounds that Ray employed as well as the background musical score, is a crucial component that sonically evokes the changing emotional atmosphere of the film. The musical score was produced by noted sitar musician Ravi Shankar, and the haunting main musical theme resonates in the mind long after the film is over. Still, one might ask, what is it that makes this a great film? Is it anything more than a rambling slice-of-life story about impoverished conditions of India (as some Indians I have known have complained)? In my view, what makes it great is the manner in which Ray has woven the stories of five people – Hori, Sarbajaya, Indir, Durga, and Apu – into a single beautiful tapestry. In this respect it differs from existentialist films, which tend to focalize on the challenging world as seen by a single answer-seeking individual. 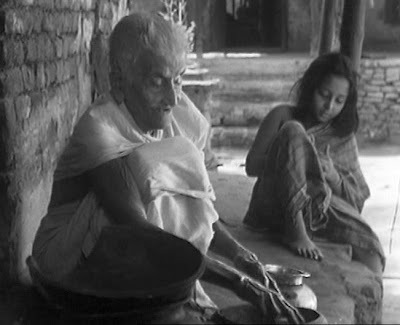 In Pather Panchali we have the existential perspectives of all five of these people interwoven together. We can empathize with and understand each of them. We want them all to find fulfilment, and yet we can see how their action can sometimes frustrate each other. The film presents to us the complexities of life in all their rhythmic and musical harmonies and dissonances. Marie Seton, Portrait of a Director: Satyajit Ray, (1971), Indiana University Press, p. 88. Your analysis is quite good. It would be really great if you would analyse the wedding sequence of this film.